Speaking as someone related to a seventy-year-old who takes the dog for daily walks of ten miles or more, I am very aware that health and exercise doesn’t stop as soon as you hit fifty. · One in five (20%) aged 55 and over are most worried about becoming less active as they age. · 48% of over 55’s admit that they are a lot less active than 20 years ago. · 51% of over 55 year olds are currently suffering from back or neck pain with 33% of those complaining that they suffer daily and 24% stating they have endured some kind of back or neck complaint for more than 10 years. At the start of Chiropractic Awareness Week 2012, the British Chiropractic Association is joining forces with the European Year of Active Ageing. Active Ageing doesn’t mean daily 10 mile walks like I mentioned in the first sentence (I couldn’t manage that, and I’m only in my mid-twenties! ), but small changes can make a big difference – just a couple of minutes stretches a day could help improve how limber you are, and that’s a good start. Walking is definitely an underrated form of exercise: try walking to the next bus-stop along (difficult in Buntingford where there are only three bus-stops in total! ), or parking the car further away when doing the weekly shop. These little things can snowball. Swimming is an amazing form of exercise which is normally subsidised for the over 60s, and helps tone the whole body and is less intensive – and more importantly, less hard on the joints – than running. Lastly, if something hurts, stop doing it! If you suffer pain beyond a simple ache, make sure you visit your chiropractor – as I often state, we do so much more than just backs! We offer free consultations, as well as exercises to strengthen any damaged muscles and joints after your initial course of treatment is completed. We hope this piece has given you some ideas about keeping active, and we always hope you’ll stay healthy along with us at Attend2Health. 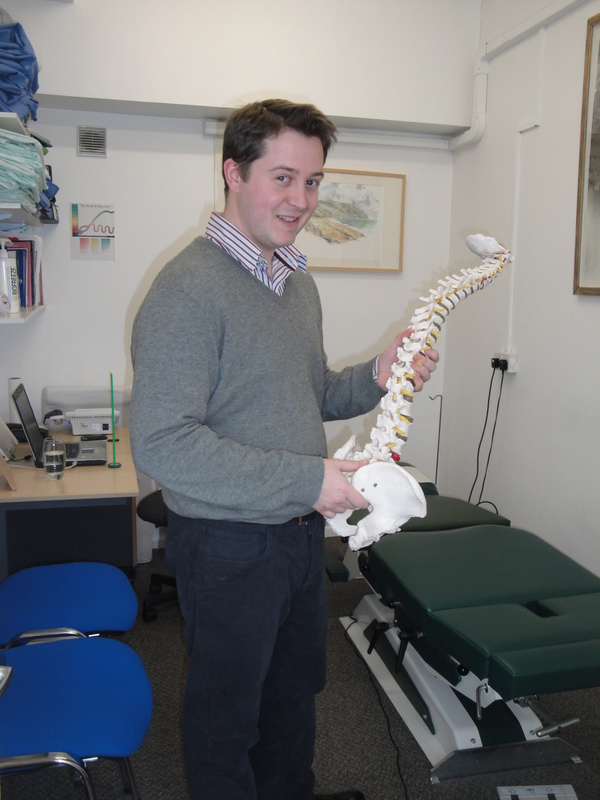 Your chiropractic appointment – in pictures! Now, we’re not exactly as interesting as the Guggenheim, but it’s good to know what a clinic looks like before you visit. Today’s post focuses on what you can expect when you come to Attend2Health to visit Alexander Smith, one of our chiropractors. This is Attend2Health (sunshine not always as pictured). 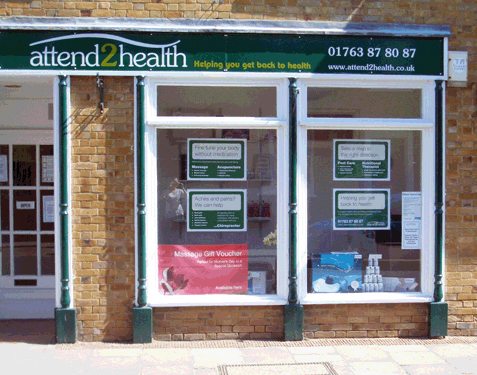 We’re on Buntingford High Street and just opposite the library. Welcome to the clinic. This is Kat, who is part of our Front Desk team. More often than not, she’s slightly hidden behind the desk. Say hello, Kat. This is the chiropractic treatment room. 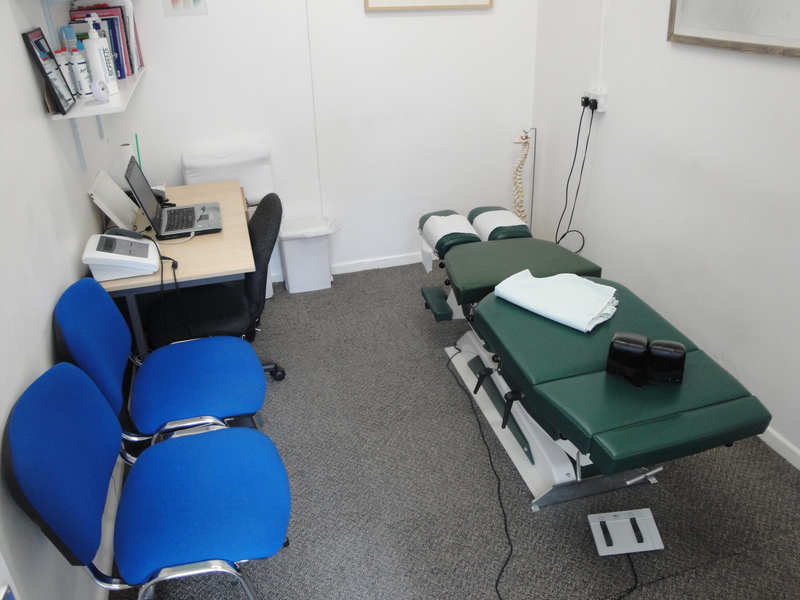 In this picture is the bench, an activator, an ultrasound machine, and some blocks. But! As useful as these are, we could definitely do with a chiropractor! That’s better. On the left is Alex. In his hands is a spine. I have it on good authority that it’s a model, and not the spine of a previous patient. On your first appointment, you’ll get a consultation where you discuss your complaint with the chiropractor, an examination, where the chiropractor examines the area causing discomfort, and a treatment. The treatment may involve mobilisation (soft tissue work), activator work – which involves a small spring-loaded spinal stimulator – and adjustments. Adjustments are those ‘cracky’ bits that you may well be aware of. What an adjustment actually does is move the joint beyond its regular range of motion, but not beyond the range of motion which the joint is designed to move. After your treatment, Alex may suggest you buy an ice-pack from our foyer, or reccommend ice and heat on the area for which you’re seeking treatment. Depending on the state of your condition, we may ask you to book in once a week, or may just wish to see you for maintenance in a month-or-so’s time. At which point, you’ll get to see Kat and Alex, or one of our other lovely Front Desk Team and Chiropractors. So, we’re not the Guggenheim, like I said, but hopefully seeing what you’ll expect makes chiropractic, and our clinic, a little less abstract and a little more real. Do you feel the cold in your joints? Arthritis sufferers struggle with weather like this more than most, but hopefully acupuncture and Alexander Technique can help. The University of York has commissioned a three year study into the effectiveness of Acupuncture and Alexander Technique into care for Chronic Neck Pain. 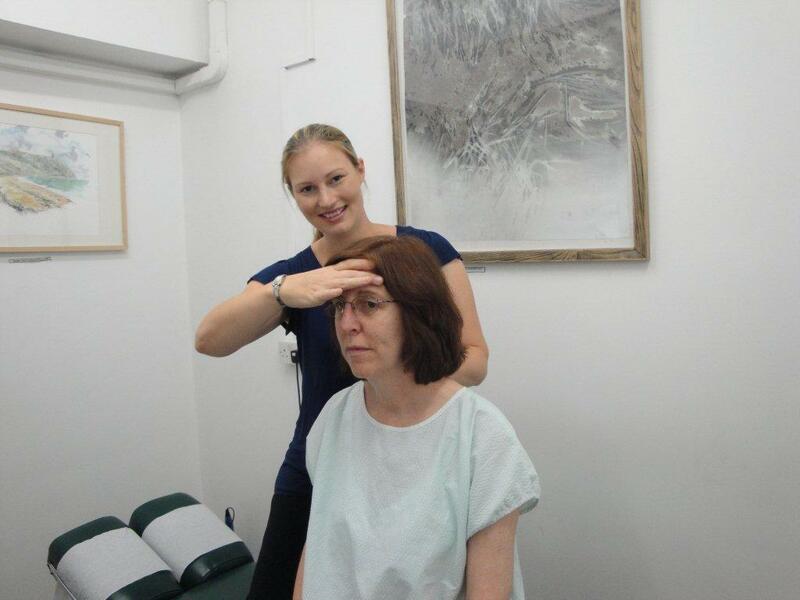 Alexander Technique lessons are designed to help people improve their posture, co-ordination and balance, while reducing unwanted responses which can cause or aggravate pain and stress. Along with acupuncture, the treatment has been shown to improve back pain and offer value for money over the long term. If you’re interested in whether we can help with your back or neck pain, give us a call on 01763 87 80 87, we offer taster sessions and consultations with our practitioners, so you can decide whether either of these treatments are right for you. With the last of the Christmas pudding finally eaten, the mince-pies already on your waistline, and the weather as unhappy with January as the rest of us, we’re definitely starting 2012 with a bang. If you’re like us and don’t take down your decorations until Twelfth Night, make sure you look after your back while doing it: bend from the knees, don’t overstretch, and don’t fall onto the remains of the Christmas tree. Speaking of Christmas… On Saturday 17th December, we held a charity treatment morning where we offered massage, reflexology and chiropractic treatments in return for donations. We raised over £250, which was then used to buy presents for children at the Lister Hospital over the festive period. 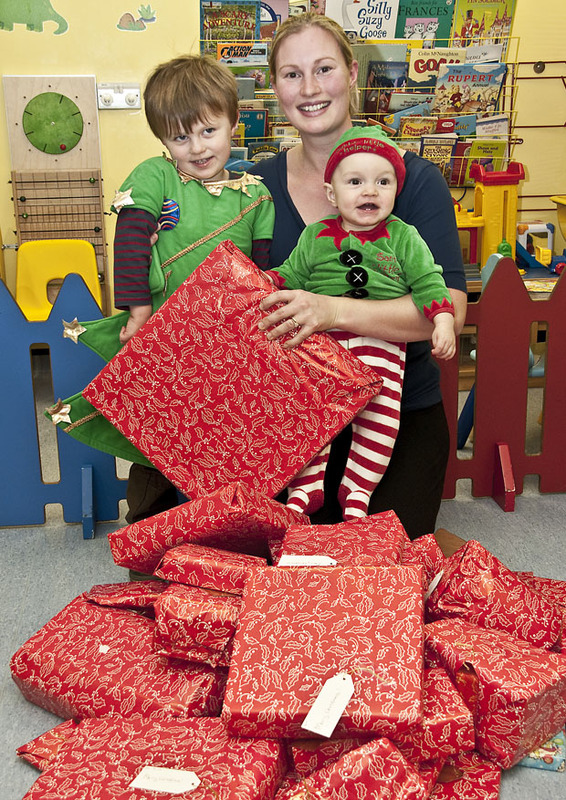 On December 23rd, Chiropractor Louise Hampton delivered the presents to the hospital. Marylin Goodhew – one of the play therapists in the children’s ward – was extremely grateful for the donations, explaining that they unfortunately had a full ward for Christmas this year. Moving swiftly back to the New Year, however – how are your resolutions going? Are you going for that run every morning, or has the weather hampered your plans before you ever managed to start? Maybe you resolved to swim every day (not too difficult in this weather), or to cut back on the carbs. Whatever you chose to do, congratulations! Committing to a resolution is the first step, and often the trickiest. Make sure you don’t over-do it in the first few weeks: stretch before and after all exercise, and stay with what’s comfortable – if you’ve not run since school, don’t expect to manage marathons before February! If you get any pains, make sure to book in with a chiropractor or sports masseuse – it might be nothing to worry about, but it’s always better to be safe than sorry. Our resolution (other than working off all of the Quality Street from the last two weeks) is to make this blog more reader-centric: let us know what you’d like to read about. Maybe you want more tips on how to take care of your back, maybe you want more information about the disciplines which we offer at the clinic. Maybe you want some more of my excellent chiropractic puns… Well, perhaps not the last one. Whatever you’d like to see in the blog, leave us a comment, or email us at info@attend2health.co.uk and let us know. Until our next update, we wish you happiness and wellbeing from everyone at Attend2Health. You’d be surprised how many Christmas Chiropractic jokes there are – what do chiropractors and Christmas table decorations have in common? They’re both ‘crackers’. … I didn’t say they were good Christmas Chiropractic jokes. But, if you’re wondering what’s festive about a health clinic (other than terrible puns), you’d be surprised. If you’re struggling for ideas on what to buy for your sister/mother/great aunt Kit, we sell gift vouchers for Sports Massage, Therapeutic Massage, Reiki, Reflexology and Indian Head Massage. It’s a great treat for someone over what can be a very stressful season, and it makes a change from the same Body Shop kit every year. We’re also gearing up for our Christmas Charity Drive. This year, we’ve teamed up with the Lister Hospital in Stevenage for a toy drive collecting presents for the children unlucky enough to be in hospital over Christmas! From November 18th, we will have a Santa Sack in clinic accepting any donations from customers – and anyone who donates a toy will be entered into a prize draw for a free treatment and we’ll be throwing a half price treatment morning on Saturday 17th December with all profits going towards toys for the children. If you have any questions, or are interested in booking an appointment for our half-price treatment day, please drop us a comment on this entry, or email us at buntingford@attend2health.co.uk, or pop into the clinic with any donations or questions you might have. We ho-ho-hope to see you there. On Saturday 1st October, Attend2Health celebrated our 4th anniversary with cake, balloons, and a Charity Treatment Day raising money for Isabel Hospice and Buntingford Action for the Less Able. Thanks to you, we were able to raise over £200 for these worthwhile causes, helping those in need in Buntingford and Hertfordshire. We would like to thank everyone who came down to the clinic on Saturday and booked a mini-treatment, who bought a raffle ticket, or who has just been one of our valued customers over the last four years. Without you, we literally could not have done this! We would like to extend special thanks to Ione Woodger-Smith at Crazy Daisy and James Radley at J Oliver Radley Opticians for their generous donations to our raffle and for their support in our fundraising efforts. Don’t forget that October sees World Arthritis Day on October 13th. If you have concerns about your joints, why not book in for a free consult with any of our friendly chiropractors. October is also Breast Cancer Awareness Month, and our JustGiving page for Isabel Hospice will still be open all month if you wish to donate to them: www.justgiving.com/attend2health. Much though we’re loathe to think about it, as the days get shorter and the nights draw in, the slide towards Christmas is inevitable. For a stress-free present option, we sell massage and reflexology gift-vouchers. And after the hassle of Christmas, who can say they wouldn’t benefit from a little pampering? Although the weather may be changeable, our dedication to your health isn’t: we are here six days a week to discuss any concerns you may have, whether it’s about your cluster headaches or your ingrown toenails – we’re here for you from head to toe. How time flies! Attend2Health turns 4 years old this month, and to celebrate this milestone, we want to give something back to the community who welcomed us so warmly. 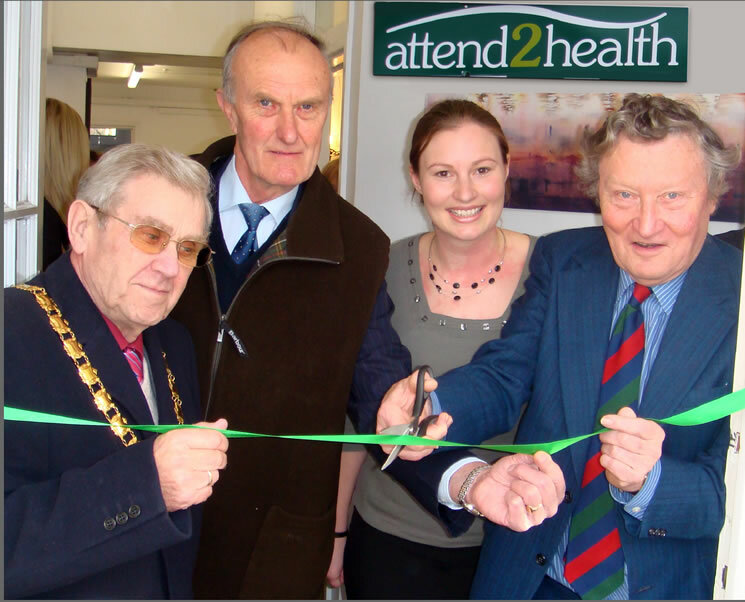 Louise Hampton, Doctor of Chiropractic, started Attend 2 Health on 25th October 2007. 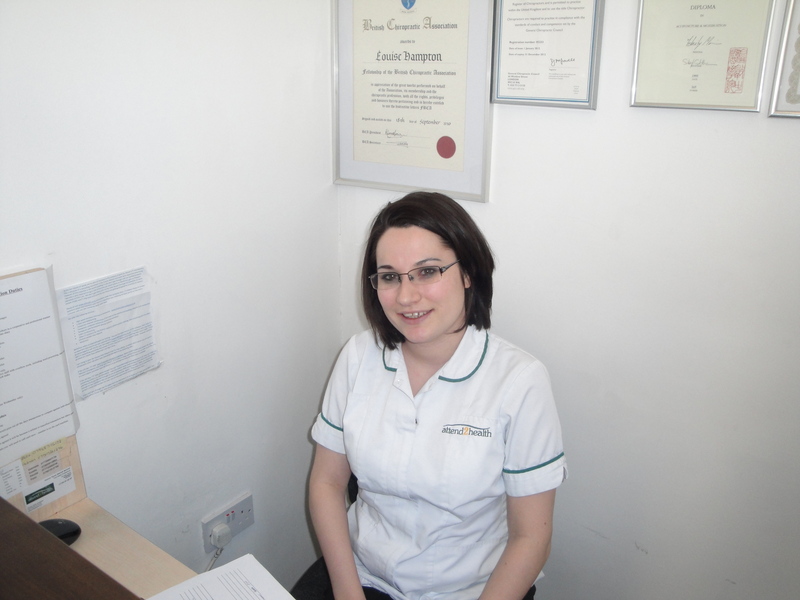 Louise has been a Chiropractor for 7 years after studying Chiropractic at the University of Glamorgan. Louise was also awarded a Fellow of the British Chiropractic Association last year and is the youngest Chiropractor to ever receive such an accolade. 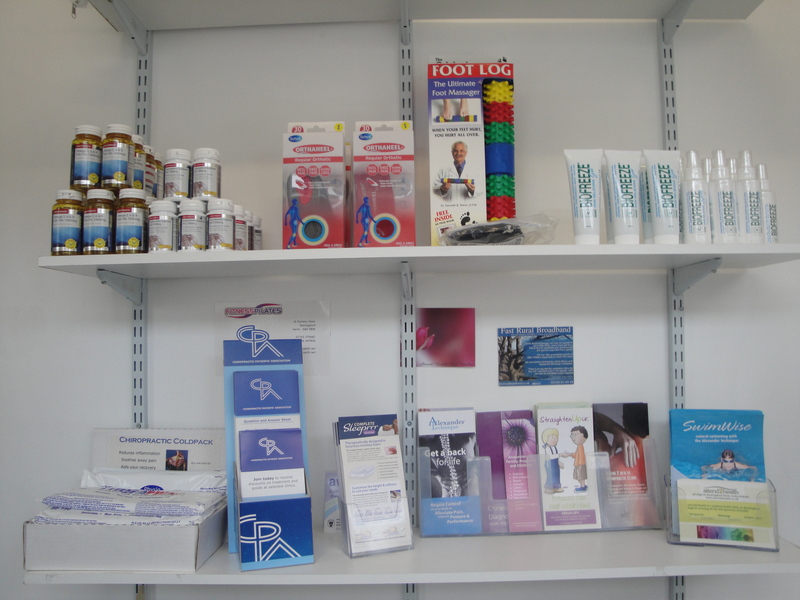 Even with the recession the practice has gone from strength to strength and now has a range of disciplines available from Chiropractic, Massage, Reflexology, Acupuncture, Foot care and Alexander Technique. We will be holding a charity treatment morning on Saturday October 1st. We will be offering mini-reflexology and massage sessions, spinal scans and chiropractic treatment, all for a small donation to charity: the charities we will be raising money for are Buntingford Action For the Less Able – a local charity for those who suffer from motion-impairment, and Isabel Hospice – a Hertfordshire-based cancer charity. There will also be a raffle, with prizes such as treatment vouchers, signed photos from X Factor finalists, and a grand prize of a digital camera. If you’re interested, be it in donating an item for our raffle (all donations greatly received and all profits going to charity) or booking a treatment, please call our friendly front-desk team on 01763 87 80 87. If you are unable to attend, but still wish to donate, please visit our JustGiving page at www.justgiving.com/Attend2Health. All donors will be entered automatically into our raffle draw. 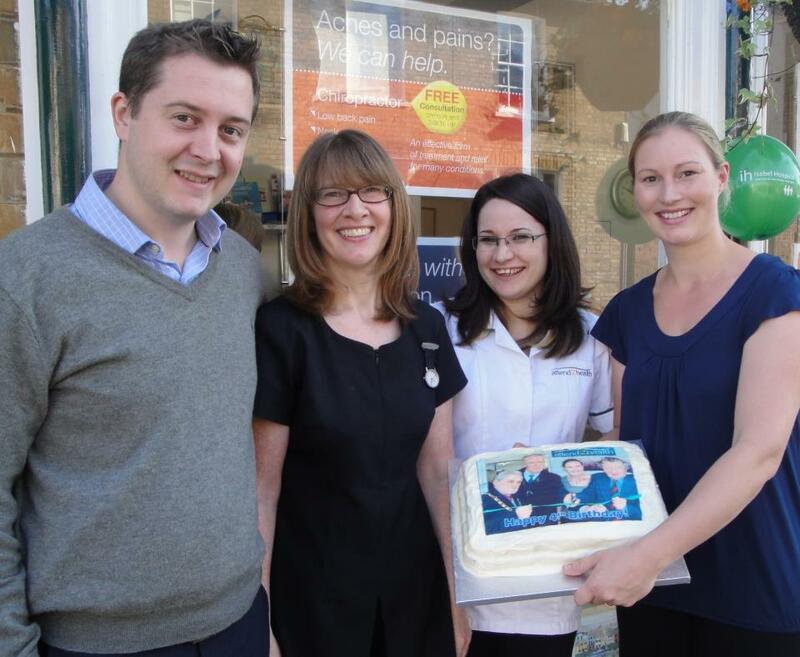 As a multidisciplinary clinic, Attend2Health has a number of practitioners working under its roof. Today’s post is a little introduction to the chiropractors working within our four walls. Our feet keep us moving, carry our weight, and help us stand tall, but we don’t always look after them the way we should. In today’s post, we look at common foot ailments, what may have caused them, and how to stop them. Are you interested in the Alexander Technique, but not sure what it entails? We view it as a preventative treatment to compliment chiropractic as a curative treatment, preventing posture problems from developing into further issues.